7 negatives : b&w; ; 120 mm. 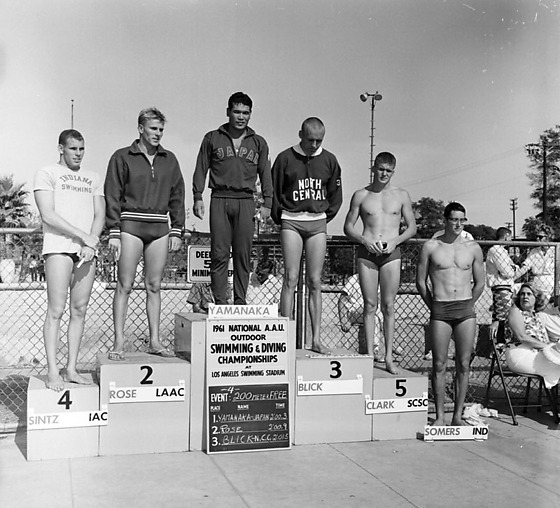 Japanese swim team in Los Angeles for the 1961 Amateur Athletic Union (AAU) Swim Meet held at the Olympic pool in Exposition Park in Los Angeles, California, May 31, 1961. Includes Japanese team in suits with Japanese flag logo greeted by Consul General of Japan Yukio Hasumi at Los Angeles International Airport (LAX) and at the Southern California Japanese Chamber of Commerce dinner; four Caucasian and Japanese men shaking hands, including Los Angeles Councilman Karl Rundberg and Eiji Tanabe (far right); portrait of coach; swimmers on winners stand, "1961 National AAU outdoor swimming & diving championships," with Yamanaka of Japan in first place for 200 meter and 400 meter freestyle and 6th in the 1500 meter freestyle; and Yamanaka with medal. 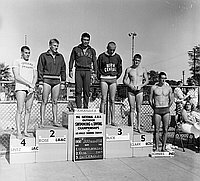 Typed on original negative envelope: Swimming Meet National AAU 1961.